The depiction of Southern Christianity is limited somewhat on Nashville (see previous entry). It also makes a small but significant appearance on another popular prime time TV show: Scandal. Part The West Wing, part Homeland, Scandal develops in two locations, primarily: the Oval Office of the White House and the Office of Pope and Associates. The main characters of the show are Olivia Pope (Kerry Washington), a manager of political crises, and Fitzgerald Thomas Grant III (Tony Goldwyn), the President of the United States and Olivia’s sometimes lover. There is much that could be said about the show; for those unfamiliar with it, a good place to start is the Scandal homepage with its featured “OMG Moments” (something of a nod to religion?). 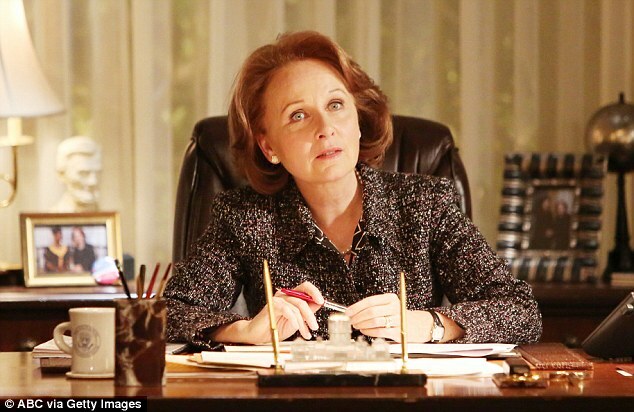 I only want to mention one character here: Vice President Sally Langston, played by Kate Burton, daughter of the actor Richard Burton. In the kinds of compromises that typify political campaigns, “Sally,” a Senator from Georgia, becomes “Fitz’s” running mate after a hard-fought Republican primary contest. Sally is there to represent or to placate the more conservative wing of the Republican Party and in that capacity she has a lot to say about sexual morality, the right to bear arms, and abortion, among other hot button issues. At first, Sally is depicted as both a true believer in her religious causes and a savvy politician. She is biding her time as Vice President, offended by the immorality she sees around her and waiting for the opportunity to capitalize on it politically. At first it seems as if Sally is done for. She is distraught. She interprets the murder as a sin: one for which she deserves to be punished. She even makes plans to confess her crime publicly during a Presidential debate. But, as in the case of Judah Rosenthal (Martin Landau) in Woody Allen’s film Crimes and Misdemeanors (1989), the guilt wears off. Sally comes to hold the Devil responsible for the murder: he used her hand as “a vessel of sin.” The contest for the White House must go on and she returns to it with renewed vigor. This entry was posted in Faculty Blog, Relevance of Humanities, Religion in Culture and tagged Expression, Morality, Religion, Scandal by Theodore Trost. Bookmark the permalink. Theodore Louis Trost is Professor in the Religious Studies Department and the New College at the University of Alabama.